Unlike the rest of this book, the five chapters that make up Part 1 contain material largely unchanged from earlier editions. This is because the material remains as important as ever—even in these days of genome sequencing. Specifically, Chapters 1 and 2 provide an historical account of how the field of genetics and the molecular basis of genetics was established. Key ideas and experiments are described. Chapters 3, A, and 5 present the chemistry thai lies at the heart of molecular biology. We will discuss the fundamental chemical principles that underlie the structures of the macromolecules that figure so prominently throughout the rest of the book—DNA, RNA, and protein—and the interactions between those molecules. While the bulk of the material is retained from earlier editions, some of it has been reorganized and more recent examples have been included. Chapter 1 addresses the founding events in the history of genetics from the classic work of Gtegor Mendel up to that of Oswald T. Avery, We will discuss everything from Mendel's famous experiments on peas, which uncovered the basic laws of heredity, to Avery's shocking (at the time) revelation that DNA is the genetic material- Chapter 2 covers the subsequent revolution of molecular biology, from Watson and Crick's proposal that the structure of DNA is a double helix, through the elucidation of the genetic code and the "central dogma" (DNA "makes" RNA which "makes" protein). This chapter concludes with a discussion of recent developments stemming from the complete sequencing of the genomes of many organisms, and the impact this has on modern biology. The basic chemistry presented in Chapters 3 through 5 focuses on the nature of chemical bonds—both weak and strong—and describes I heir roles in biology. Our discussion opens, in Chapter 3, with weak chemical interactions, namely hydrogen bonds, and van der Waals and hydrophobic interactions. These forces mediate most interactions between macromolecules—between proteins, or between proteins and DNA, for example. These weak bonds are critical for the activity and regulation of the majority of cellular processes. 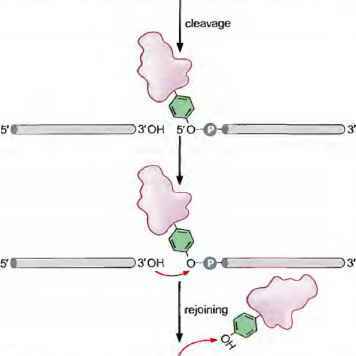 Thus, enzymes bind their substrates using weak chemical interactions; and transcriptional regulators bind sites on DNA to switch genes on and off using the same class of bonds. Individual weak interactions are very weak indeed, and thus dissociate quickly after forming. This reversibility is important for their roles in biology. Inside cells, molecules must interact dynamically (re-versibly) or the whole system would seize up. At the same time, certain interactions must, at least in the short term, be stable. To accommodate these apparently conflicting demands, multiple weak interactions tend to be used together. Strong bonds hold together the components that make up each macromolecule. Thus, proteins are made up of amino acids linked in a specific order by strong bonds, and DNA is made up of similarly linked nucleotides. (The atoms that make up the amino acids and nucleotides are also joined together by strong bonds.) These bonds are described in Chapter 4.
three-dimensional shape, Likewise, it is weak bonds that hold together the two chains of the ON A molecule. We also consider, in Chapter 5, how the function of a protein can be regulated. One way is by changing the shape of the protein, a mechanism called aliosteric regulation. Thus, in one conformation, a given protein may perform a specific enzymatic function, or bind a specific target molecule. In another conformation, however, it may lose that ability. Such a change in shape can be triggered by the binding of another protein or a small molecule such as a sugar. In other coses, an al-losteric effect can be induced by a covalent modification, for example, attaching one or more phosphate groups to a protein can tr igger a change in the shape of that protein. Another way a protein can be controlled is by regulating when it is brought into contact with a target molecule. In this way a given protein can be recruited to work on different target proteins in response to different signals.